​ Dr Casey Berardo ND is looking after all of her patients and her practice during this time with the guidance of Dr Smith. The clinic will be open regular hours. Dr Smith will have limited to no access to email so please contact the clinic if you have any concerns. Dr Berardo has a general family medical practice with particular interest in digestive disorders, women’s health, holistic weight loss, pediatrics, acute/chronic pain management and optimizing mental health and physical performance. Dr. Berardo practices medicine with compassion and educates and empowers individuals so they can improve their health and lifestyle while creating lasting changes. 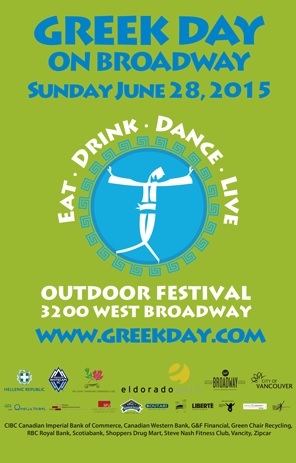 They are offering 30% OFF* purchases on this day along with free talks, live music, and many give aways. Dr Smith will have a table and can help you decide if you are deficient in a very important mineral! They are also hosting a head shave and silent auction benefiting the Canadian Cancer Society - drop in-store now to donate! Entry into our prize draw with each donation. Dr Smith and the Nest will have a booth set up at the Cloverdale Markets Days on August 18 and Sept 22, 2018. The Cloverdale Arts & Entertainement Association puts on a great market with many wonderful venders! 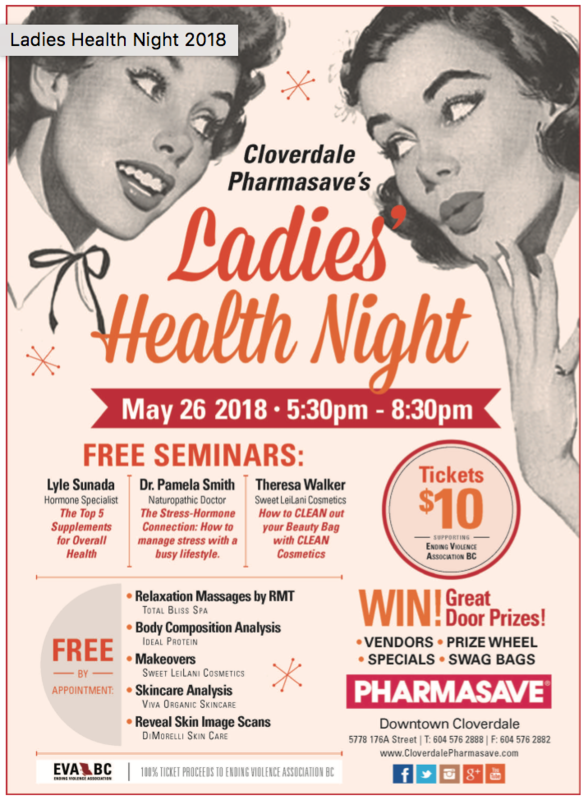 Dr Smith is excited to present at this year's Ladies Night hosted by Cloverdale Pharmasave, see flyers for more details and don't forget to get your tickets early! Announcing Dr Smith's Upcoming Move! ​The Nest Family Wellness Centre in Cloverdale BC as of December 5, 2017. Her last day at Village Health Clinic is November 29, 2017 and her last day at Divine Elements is December 21, 2017. Join Dr Smith for a night of networking, learning, food, & drink! We all know that true beauty lies within. However, we often feel our outer beauty could use enhancement and would love for the aging process to be slowed down or reversed. Fine lines and wrinkles are signs of aging skin and can easily and naturally be restored with fullness and elasticity. The best part is you can obtain this without using invasive aesthetic procedures. 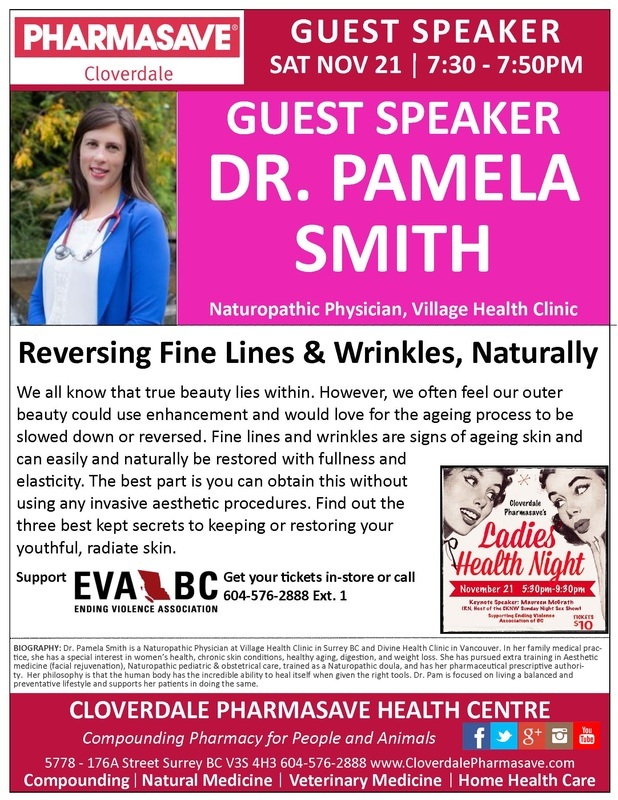 Join Dr Smith at Ravita Health to learn the 3 best secrets to taking care of your skin and more info and treating chronic conidtions such as eczema, psoriasis, and rosacea. Tickets available to save your seat as seats are limited - EventBrite Proceeds go to charity. Join us on the last Thursday of every month from 6:30 to 8:30 pm for our EveryDay Woman Workshop! Are you Worth it? We will start the year off by looking deep into your worth and how much you value yourself. This will then allow you to create the year that you want! 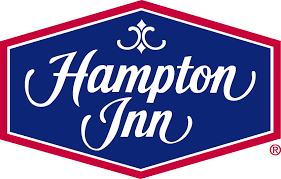 Dr Smith will be providing health information and B12 shots to the employees and guests of Hampton Inn & Suites by Hilton Downtown. If you are in the area, please come by and say hello! Join us for our monthly Women Health Talks. End your day with some yoga, girl talk, and of course food! The Today's Woman-what defines her and how does this manifest in her physical body. Come and get inspired and empowered! 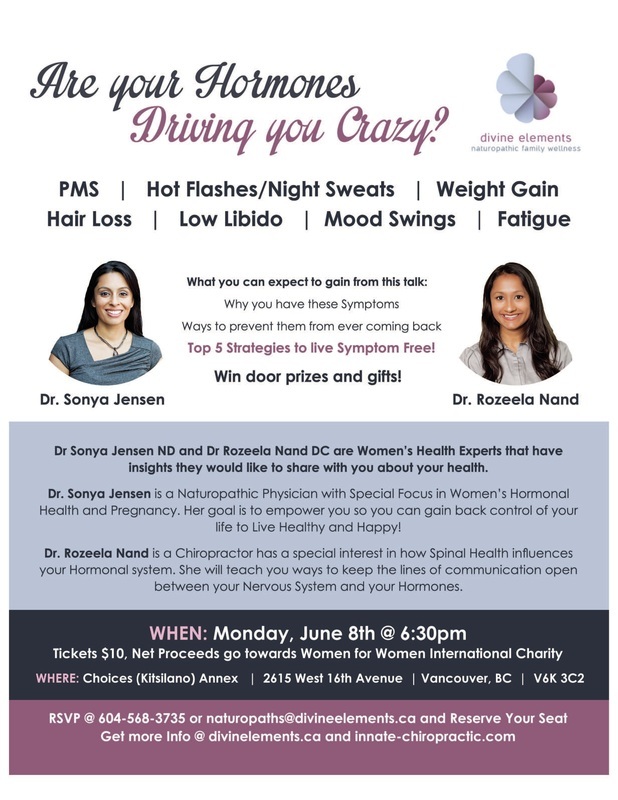 Dr Sonya Jensen will be leading this event going over all the effects stress has on our physical health, especially our hormones! Learn ways you can live the life you want while still doing all that needs to be done with ease! Our team at Village Health Clinic was at the 2nd annual Aging Gracefully trade show hosted by Cloverdale Pharmasave on Saturday Oct 1, 2016 . ​Stop by anytime between 10-4pm. ​Interested in learning more about what nutrients you may be missing?? 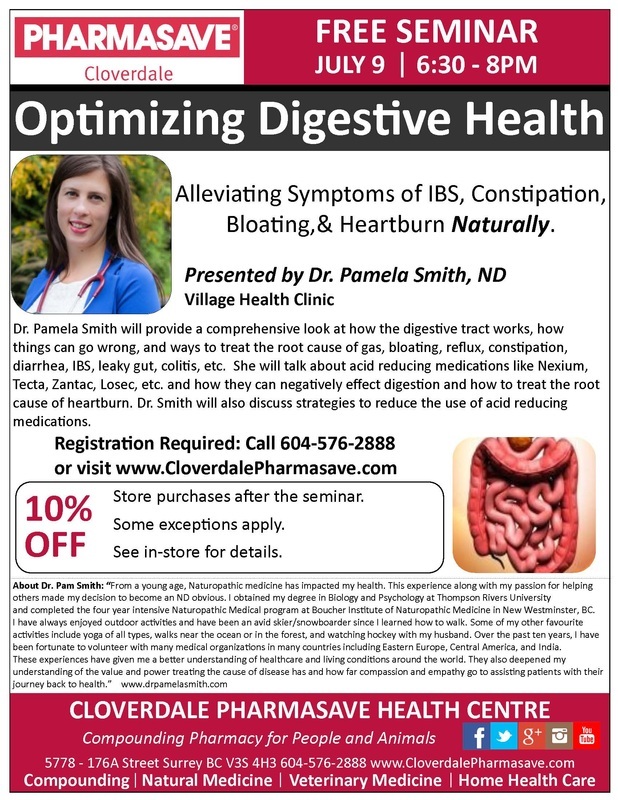 Join Dr Smith and the Cloverdale Pharmacy team on July 20, 2016 to identify just what you and your family may be missing! Networking Opportunity while Learning How to Optimize Your Health Routine! Join BNI Summit every Wednesday at 645am to network with other professionals. 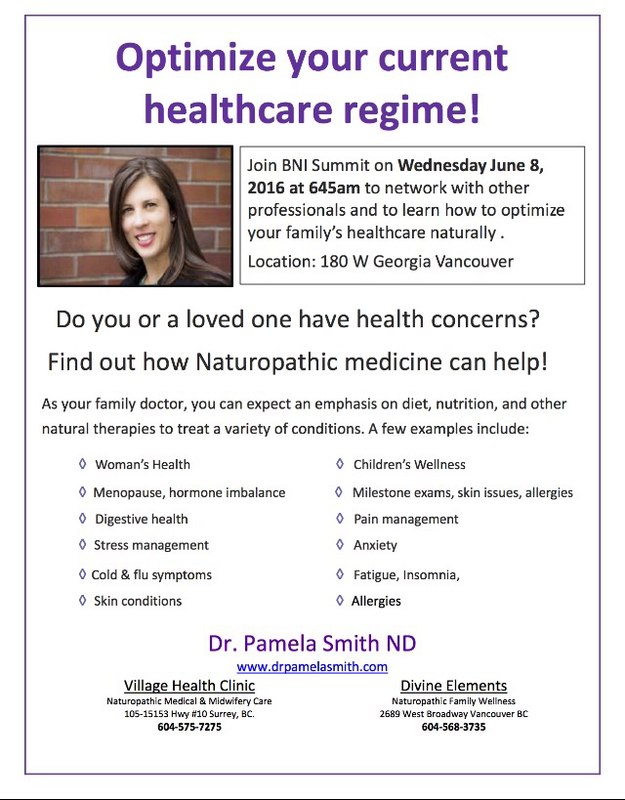 On June 4, 2016 Dr Pam will be giving a presentation on how naturopathic medicine can optimize your family's healthcare. 9th Annual CHNC Conference on May 28, 2016. The investment is $25 of which a portion will be donated to charity. With the beginning of a new year this is a great time to set your intentions on the kind of year you would like to have. It is a great time for reflection to figure out what serves you and what doesn't. Instead of setting new years resolutions lets focus on creating a new you from all that you have learned about you and your health so far. This way there is no pressure to complete a resolution but instead an understanding between you and yourself that transformation can be an everlasting thing that will nourish, recharge, and build you up from now on. Let us help you! Sign up for our 30 Day Healthy Transformation Program by February 29th and save! Originally $769 now only $599! Guaranteed Transformation in Just one Month! Only 10 Spots so sign up at Divine Elements now!! Dr Pam will be presenting on how to have glowing, youthful looking skin. She will also be at a booth giving health checks. There will be tons of prizes and other great speakers. Tickets are $10 - contact Cloverdale Pharmasave today to get your tickets! Did you know menopausal symptoms may begin as early as age 37 (perimenopause) and may last a lifetime in others. This educational and entertaining evening is aimed at helping women (and men!) understand ‪‎hormones‬, menopause, sexual health,‬ and the impact on intimacy and relationships. See the trailer below. 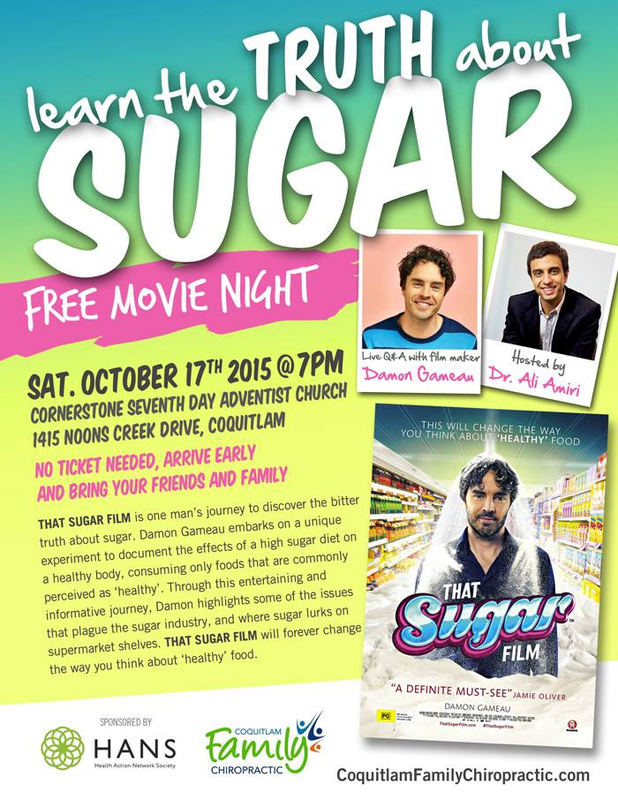 Come learn the truth about sugar with a free screening of That Sugar Film, hosted by Coquitlam Family Chiropractic clinic. A live Skype interview with filmmaker Damon Gameau will follow. Dr Ali, owner of Coquitlam Family Chiropractic is truly passionate about helping others live a healthy lifestyle and leads by example. Alive and Pure and Dr Smith will have a table set up to answer any health questions you may have. Location: 1415 Noons Creek Dr. Coquitlam, B.C. Detox with the Docs this fall! The change in season is a perfect time to do cleanse. Detoxification provides support for emunctory organs like the liver & kidneys and gives your digestive system a break giving you a boost in energy and improves your overall health. Our 10 day detoxification program provides you with all of the necessary tools to successfully complete a 10 day detox for only $200 (regular $357) when you sign up by October 1st, 2015. Get your family, friends, and coworkers involved for more motivation! Burdened with Wrinkles & Fine Lines?? Mesotherapy is a nonsurgical technique that stimulates the middle layer of the skin, the mesoderm, using a variety of nutrient based injectable solutions to reduce fat accumulation, fine lines, and wrinkles. The procedure involves superficial injections into areas of fat accumulation or aging skin. Small amounts of medication will be injected into multiple areas of the subcutaneous fat layer or into areas of concern on the face & neck. This leads to localized fat reduction or smoothing out of aged skin with results noticeable within five treatments. The most common areas include: face, thighs, abdomen, hips, and buttocks. Dr Smith will be giving a seminar on how to optimize your digestive health. She will be focusing on common concerns such as IBS, constipation, and heartburn/GERD. Dr Smith was at Greek Days this year. There were some great prizes and people got to finally find out their blood type! 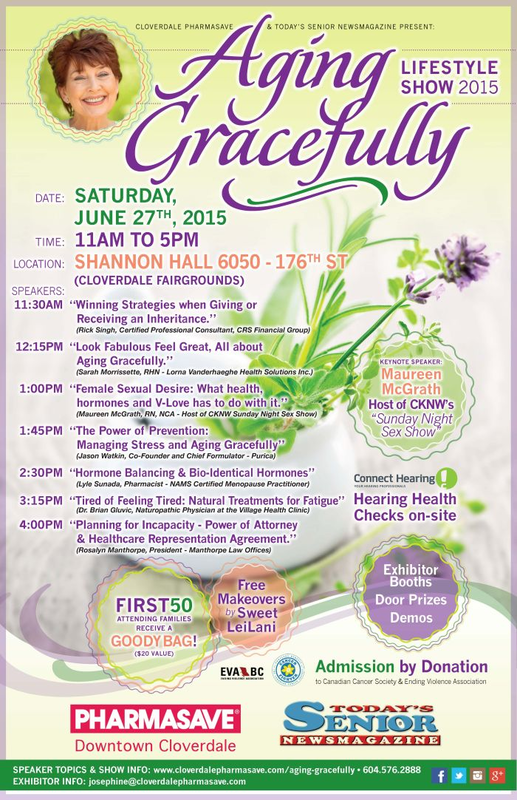 Aging Gracefully Lifestyle Show June 27, 2015! Enter to win a free initial visit! 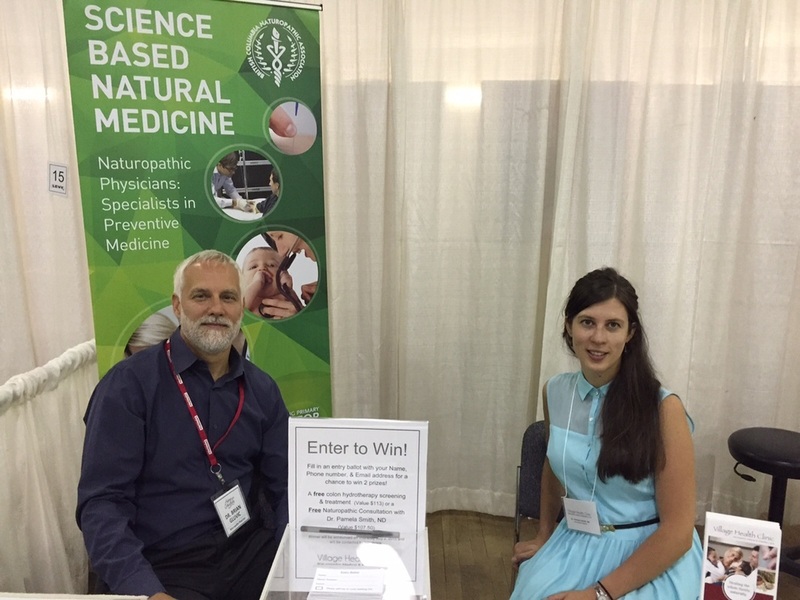 Dr Brian Gluvic & Dr Pam at their booth for the 1st annual Health show presented by Cloverdale Pharmasave. See everyone next year! Let's face it, we are ALL aging! Learn how to do it gracefully at the 1st Annual "Aging Gracefully" Lifestyle Show presented by Cloverdale Pharmasave and Today's Senior Newsmagazine. Dr Brian Gluvic will be speaking at 3:15 pm on Natural Treatments for fatigue, are you tired of feeling tired?? Visit Dr Gluvic & Dr Smith at their booth and enter to win a free initial visit and follow up with Dr Smith! physician. The amazing staff are like a family to me. Are your hormones driving you crazy?! Dr Sonya Jensen ND of Divine Elements and Dr Rozeela Nand DC from Innate Chiropractic provided valuable information on how hormones may be influencing your current health concern. Dr Smith will be helping out with registration so make sure to come by and say hello! This years Naturopathic Medicine Week starts on May 11, 2015 - Click here to find out what is going on in your neighborhood! Blood pressure checks, and many more! It is common to increase your health through supplementation but how do you know what you are taking is the best for you? 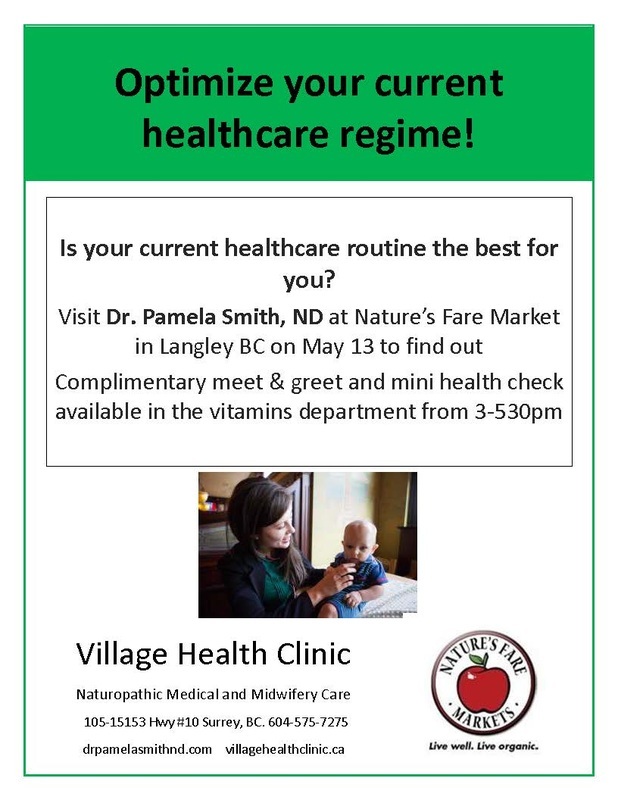 Stop by the vitamin department at Nature's Fare in Langley BC on May 13 to discuss your supplement regime with Dr Smith to see if it is right for you. Tickets can be bought following this link for $10, get yours today as seats are limited! 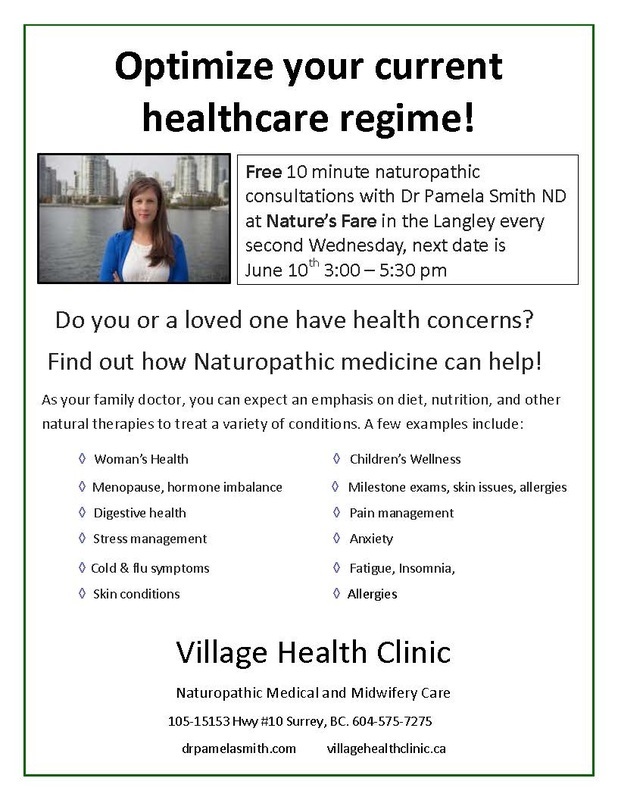 Free 10 minute naturopathic consultations at Shoppers Drug Mart in the Panorama Village! Bring any questions you may have about your health concerns or health products generally. 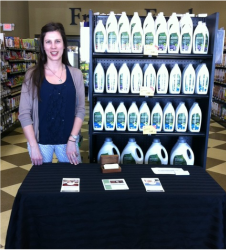 Join me for a free Meet & Greet at Nature's Fare in Langely! Are you interested in identifying the underlying cause of your current health concern? Naturopathic medicine may be a good fit for you. I will be set up in the vitamins department to answer any questions or concerns you may have. Having fun at Nature's Fare! 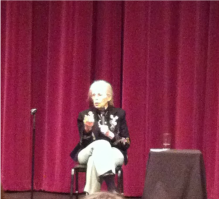 Ina May on stage in West Vancouver. Such an inspirational speaker! Make sure to say hello if you are also attending!! Ina May Gaskin, MA, CPM, PhD(Hon.) is founder and director of the Farm Midwifery Center, located near Summertown, Tennessee, founded in 1971. The Farm Midwifery Center has assisted with approximately 4000 births, with remarkably good outcomes. Dr Ali Amiri, D.C. is hosting another informative movie night and Alive and Pure and Dr. Smith will be there ready to answer your health questions! Dr Ali, owner of Coquitlam Family Chiropractic is truly passionate about helping others live a healthy lifestyle and leads by example. This documentary along with special guest from the documentary Dr Richard Oppenlander will help educate us on what we can do to help save our planet. Chatting about health while enjoying tea! Our clinic is having an open house and we would love for you to join us! Sign up for free 5-10 minute consultations with our health care practitioners. The Village Health Clinic offers Naturopathic Medicine, Midwifery, Acupuncture, Massage Therapy, & Colon Hydrotherapy. Come visit us at our table before and after the free viewing of the documentary "Happy" with special guest from the movie, Melissa Moody. This event is hosted by Dr. Ali Amiri DC, owner of Coquitlam Family Chiropracti﻿c. Dr. Amiri is truly passionate about helping others live a healthy, happy lifestyle and leads by example; he is an inspiration! The event starts at 7 pm and seating generally fills up! Dr. Pam at her table ready to talk natural health!